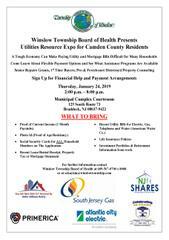 Utility Resource Expo for Winslow Township Residents. Thurs. 1/24/19 2pm-8pm at the Municipal Complex (Courtroom). For details, vendors and tips on what to bring please visit www.winslowtownship.com or view attached flyer.